© 2010 Win-Win Workplace Solutions. Design by Alan Herman & Associates. Programming by Formula. 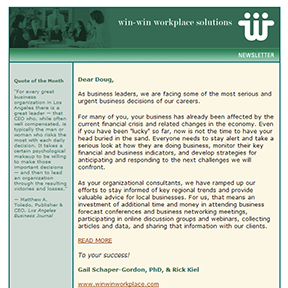 From 2005 through 2011, I edited and, through iContact.com, sent out e-newsletters from Win-Win Workplace Solutions to hundreds of CEOs, executive directors of nonprofits, and other influential clients and colleagues. Click here to read one of the newsletters. As Win-Win’s webmaster, I also posted these newsletters, filled with terrific insights and strategic advice, in an online archive (with a search function I included). Finally, I am proud to add that they chose to include in one of their respected e-newsletters a lengthy, in-depth article I researched wrote on teamwork and leadership — Coach John Wooden: A Leader’s Leader — in the wake of the great, yet humble man’s passing.